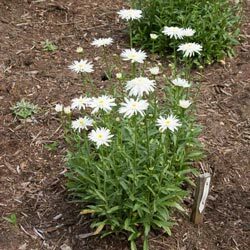 This delightful Shasta daisy is sure to bring smiles to the summer garden—and attract pollinators and butterflies. Jimmy Whittock originally introduced this cultivar in the 1960s in Kilmacolm, Ayrshire, and named it after his daughter. It fell out of circulation for a while but has now been reintroduced. With its distinctive flowers and easy care, we expect gardeners to fall in love with Fiona Coghill Leucanthemum all over again. 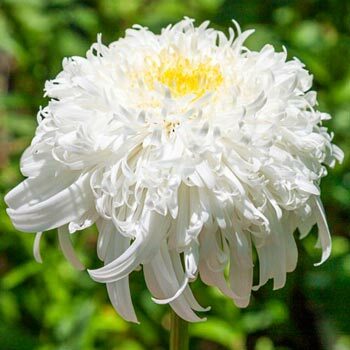 The fragrant, shaggy, double white daisylike flowers with creamy-yellow center petals are held on sturdy, upright stems. 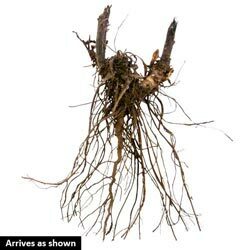 It's a great choice for the cutting garden, mixed perennial bed or containers. This easy-care perennial also makes an eye-catching cut flower. Foliage Type: Sturdy, upright flower stems clad with coarsely-toothed, narrow-elliptic medium green leaves. Flower Form: Shaggy double white daisies with the creamy-yellow center petals. Pruning: Remove spent flowers to increase bloom time. Divide every two years in the spring.